TECHNICAL SPOTLIGHT Why Go Cloud-Native? The Benefits of a Multi-Tenant, Cloud-Native Analytics Offering: An IDC Technical Spotlight Sponsored by Sumo Logic (March 2016) Register now to download our IDC Technical Spotlight: Why Choose Multi-Tenant Cloud-Native Services for Machine Data Analytics IDC believes that the transition from on-premises software delivery to cloud-based software delivery is near completion, with 88% of net-new software and application offerings currently delivered as services. Why Choose Multi-Tenant, Cloud-Based Services? Cloud analytic services running on platforms such as AWS — built for multi-tenancy and with a host of other critical differentiators — are superior to single-tenant cloud hosted services or on-premises deployment running old-school enterprise software. Some enterprise management software stack companies running on AWS have chosen not to build multi-tenant cloud-native services from the ground up. Instead, they have taken shortcuts in service — operationalizing their enterprise software architected over 10 years ago and deploying it on AWS as-is to avoid the burden of rewriting code. These shortcuts negatively impact performance and scalability and lack or limit some features of multi-tenant cloud-native management stacks. This paper provides clarity on how to choose a cloud analytics platform that helps you realize the benefits of cloud — such as agility, visibility, and elasticity — without compromising security. The more human intervention is required for log analytics, the more painful it becomes to scale. 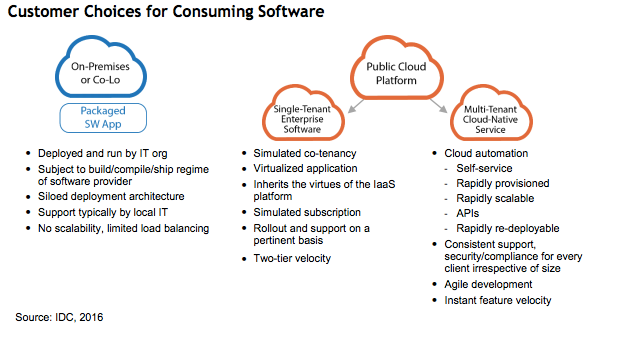 To help organizations avoid costly mistakes, we describe key differences between management stack vendors with multi-tenant cloud-native services and traditional enterprise software running on AWS or other cloud platforms. You can use this information to evaluate any vendor for a cloud-based log analytics service and as a framework to evaluate vendors providing management stack solutions.